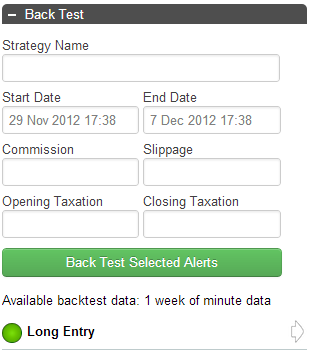 The TimeToTrade Back Testing feature can be used to test alert based trading strategies on historical price data. To backtest a trading strategy you will need to set up a simulated trading account. Click here for help on how to do this. In the following example, a simple alert based trading strategy will be tested. 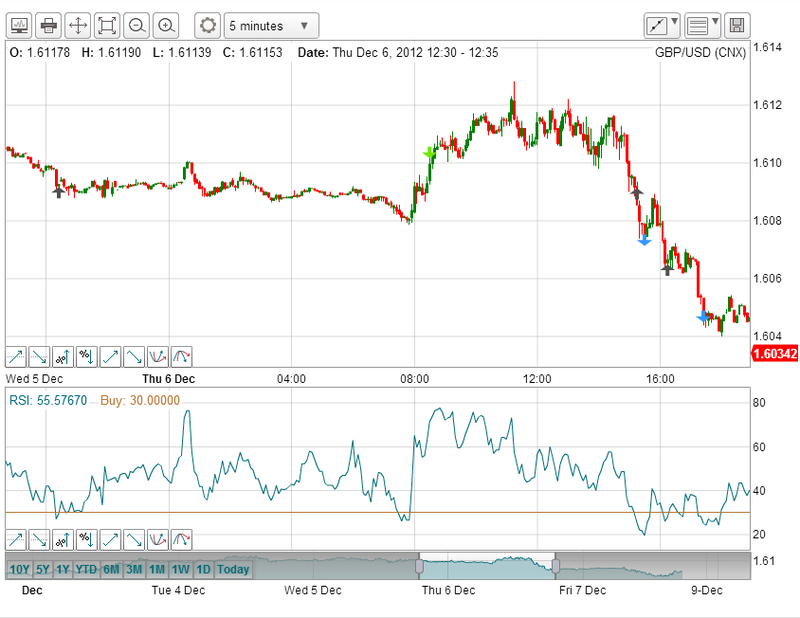 The strategy will test buying each time the 5 minute RSI falls below 30. In this example a trade will be executed when the RSI falls below 30 using a 5-minute candle interval if there is no existing position i.e. if no position, execute trade. If there is no open position when the RSI falls below 30, a simulated trade will be executed by buying a 100k Forex lot. 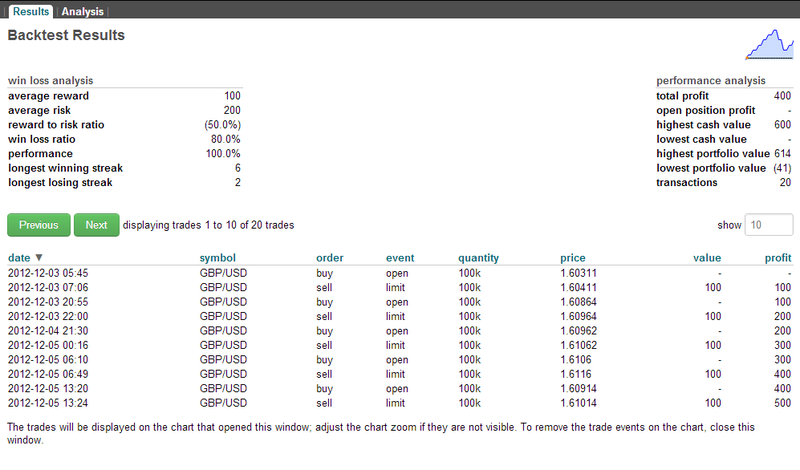 Take Profit and Stop Loss orders will also be created. 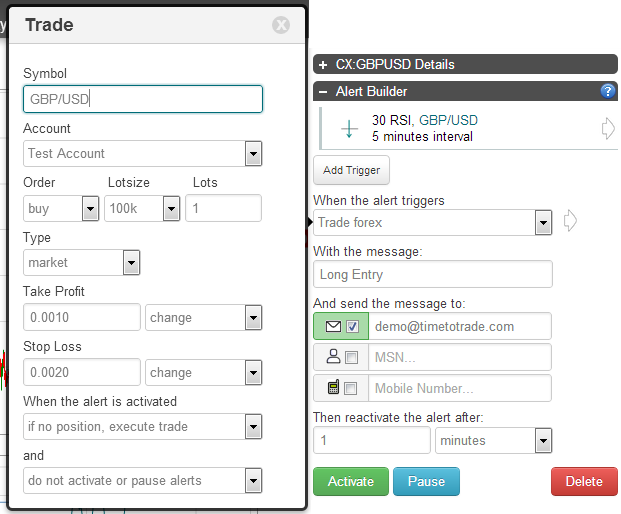 In this example the alert based trade has been set up to Take Profit if the price rises by 0.0010 from the opening trade price, and a Stop Loss if the price falls by 0.0020 from the opening trade price. The strategy that is being tested can be named, the date range adjusted, commission, slippage and taxation values set. Note that slippage is used to reduce the profit by increasing or decreasing the trade execution prices. To analyze the backtest results, click on the 'View Detailed Backtest results' button and that will open up a tearaway chart and display the trade events on the chart as per the following screen shots. 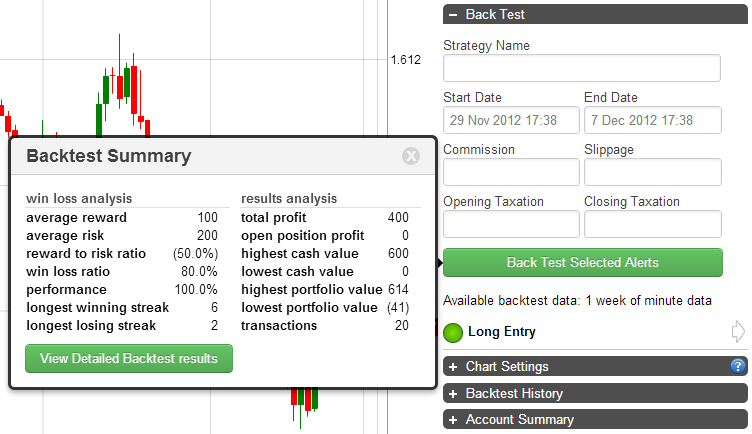 The backtest analysis tab on the tearaway provides a detailed analysis of the trades and related take profit and stop losses. The first bar graph shows the profit per trade with information on the frequency of the winning and losing trades and an analysis of the average time it took for winning and losing trades. The second bar chart represents the maximum profit that could have been achieved for each trade. In addition it calculates the average high and the standard deviation of those highs. The standard deviation means that approximately 95% of trades are within the quoted value. The third bar represent the same information but this time looking at the stop loss values. Please note that back testing is only available on the Live Trading Account. Click here to upgrade your account to use this feature.